A bucket list of the top sights at Auch, ordered by popularity. Auch (French pronunciation: ​[oʃ]; Gascon: Aush or Aux [aʊʃ]) is a commune in southwestern France. Located in the region of Midi-Pyrénées, it is the capital of the Gers department. 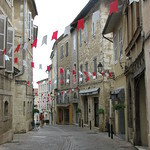 Auch is the historical capital of Gascony.